I am currently looking for a (good, engaging, well-paying, interesting) job. My friend Katherine's sister told her that she applied to nearly 100 jobs before she found the one that was perfect for her. 100 jobs (100!). Needless to say, we have both decided to crack down a little more with this job hunting business. *Sigh* I just love that ending. I totally believe in fortune cookies. 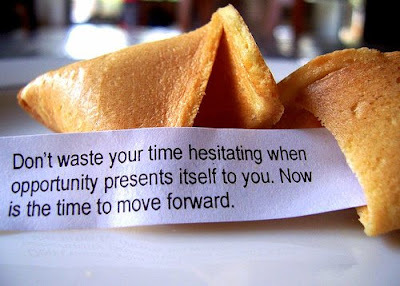 Follow the wisdom of the cookie, Metta!